Get updates about the World of Arcas Series by visiting and liking our Facebook page! The last kingdoms of Arcas possess enduring youth, beauty, and wealth but have slowly crumbled under the weight of endless apathy and a painful past. The rising evil of Gurges Ater now threatens to reopen the ancient kingdom pillars created long ago as passageways between Earth and Arcas. With access to both worlds, Gurges Ater will quickly conquer the weak kingdoms and establish his own throne. 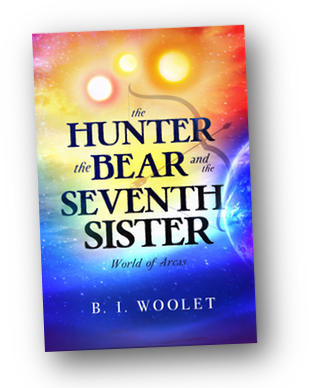 Can Jackson along with a paranoid bear, a lone hunter, and the surviving seventh sister work together to protect both Earth and Arcas? Or will the unlikely heroes allow their own fears, pain, and past to paralyze them as Gurges Ater opens the pillars and claims the throne? The publishers behind the World of Arcas book series. We are publishers of science fiction and fantasy novels along with the media and publicity related to those novels. ArcasArts was founded in 2013 and is a member of The Independent Book Publishers Association. ArcasArts is the exclusive publisher of the World of Arcas books. The first book of the series The Hunter, the Bear, and the Seventh Sister was released January 28th, 2014. The second book of the series is due for release in 2015. We are not taking any other novel submissions or publishing any other material at this time.